Description: Have you ever noticed how the related suggestions highlights as you start typing in the Google search box? This is called AutoComplete. So if you want Google type auto complete TextBox functionality then we can also implement this functionality in our asp.net web applications using AutoCompleteExtender control of AJAX. AJAX is very powerful tool for improving performance, look and feel. The concept is simple. When you start typing in the TextBox, AutoCompleteExtender fetches the matching strings from the database and display while typing e.g. when you type a single character ‘m’ in the TextBox then all the Qualifications starting with ‘m’ will be fetched and displayed. Implementation: Let's create an asp.net sample website to it in action. If you don’t know how to install Ajax control toolkit then read the article How to install Ajax Control Toolkit in Visual Studio? is automatically added on dragging the AutoCompleteExtender control form Ajax toolkit in the very second line just below the <@page> directive which is always very first line of the design page(.aspx).This means Ajax is now registered to be used. TargetControlID - The TextBox control where the user types content to be automatically completed e.g. In our case Qualification TextBox. ServiceMethod - The web service method that we created for fetching the list of Qualifications from the database. MinimumPrefixLength - Minimum number of characters that must be entered before getting suggestions e.g. if you type ‘a’ then matching string starting with character ‘a’ will appear. CompletionInterval - Time in milliseconds when the timer will kick in to get suggestions using the web service. Always keep it as low as you can so that it fetches the suggestion immediately. If you set CompletionInterval =1000 then it means it is set to 1 second because 1000 milliseconds =1 second. EnableCaching – It is a Boolean property to check whether client side caching is enabled or disabled. Now in the code behind file (.aspx.cs) create the static function to automatically Fetch Qualifications on typing in the Qualification TextBox. e.g. When you type a single character e.g. ‘m’ then all the Qualifications starting with ‘m’ will appear like suggestions. 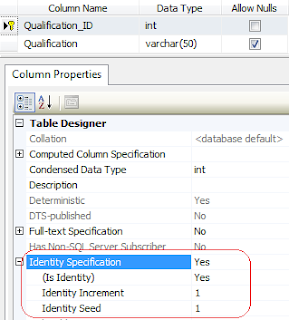 Now run the website and check by entering single character of the qualification name that is in your Database table. 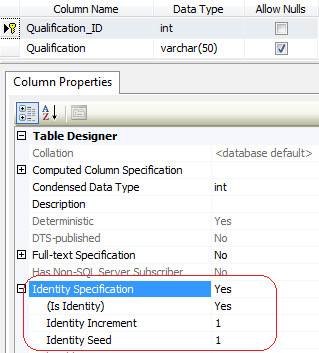 It will show all the matching Qualifications starting with entered character. I suggest you to recheck the code thoroughly and if still you face problem then let me know. I will help you resolve it. Hello sunil..its completely working..can you please describe the problem you are facing? it doesnt work to me. could you help me? Hello Christian Yonathan..what problem you are facing?? Be sure to define your C# LIST method with STATIC (ex. : public static List...). Spent way to much time trying to figure out why it wasn't working so I thought I would share. Thank you for this great article, got it to work. Any suggestions on how to handle an instance where my lookup result should also return the looked up record ID ? Similar to how we would use a drop down list control with a Data Text and Data Value field ?